This page was suggested by Gray, thanks! The twelfth-wave transformer is a bit of a misnomer, but it is easier to say than the "two-twelfths-wave" transformer. 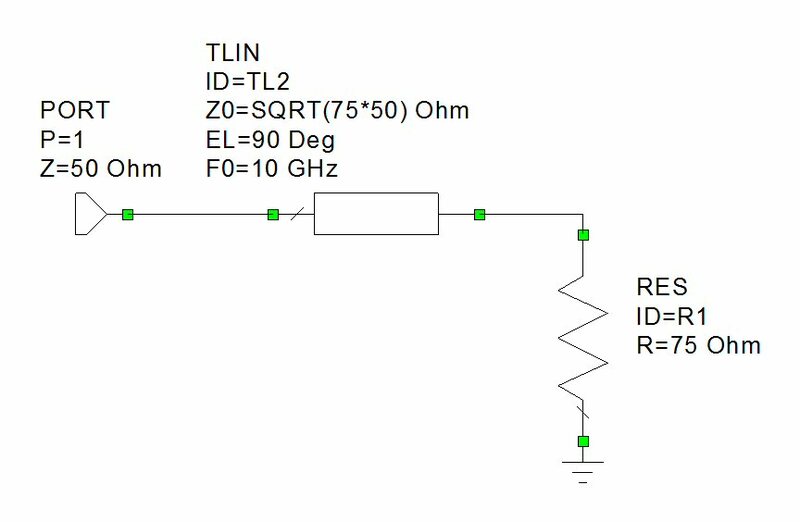 Also known as the Bramham transformer, you can use it as a substitute for a (longer) quarter-wave transformer and reduce length by approximately 33%. In addition to being shorter, it possesses the advantage that when matching bewteen cables of two different impedances, you don't need a cable of a third impedance. Ham people love this concept... What's the down-side? Slightly less bandwidth than a quarter-wave transformer. In the modern microwave world of microstrip, you can make arbitrary impedance lines, so that second advantage goes away. Another advantage comes your way, which is the obscurity of this technique. Say you are at a design review for a solid-state power amp using Wilkinson splitters. Blank looks come across all faces when you reveal that you used a Bramham transformer on the input of the splitter to increase bandwidth. Someone asks, what is that...? And you state: "the twelfth-wave transformer dates back to 1959, I thought everyone was familiar with this. say, don't you read Microwaves101?" Bramham's original article was published in 1959. The title is "A convenient transformer for matching co-axial lines", found in CERN Report Number 59-37. CERN, as in European Organization for Nuclear Research, was founded in 1954 and still doing cutting edge research on what the universe is made of, confirming the Higgs boson in 2012. CERN provides Bramham's original article here. In 1961 he published the article under the same title in Electronic Engineering, (Jan.1961.,Vol.33 no.395). CERN is located in Switzerland, near Geneva, the west end of Lake Geneva. On the east side of Lake Geneva is Montreax, made famous in the song Smoke on the Water, where "some stupid with a flare gun, burned the place to the ground" back on 4 December 1971. Claude Nobs, also known as Funky Claude, the hero of the song who pulled "kids" out of the fire, was founder and general manager of the Montreax Jazz Festival. Claude Nobs passed away on 10 January 2013. In a Microwave Journal issue in 2011, Peter Bramham discusses the history of his transformer, which is worth a read. Say, why isn't Peter Bramham listed in our Microwave Hall of Fame? Because we are waiting for a picture of him (hint, hint). Here is a link to a Bramham calculator if you are interested in the exact line lengths of the sections (which depend slightly on how mismatched the two impedances are). In most cases you are going to want to include the parasitics of the step junctions, so you will optimize the sections in your favorite linear analysis tool. Here's how you would start the analysis. Suppose you want to match 50 ohms to 25 ohms (as you might in a power splitter). At the fifty-ohm side, start with a 25 ohm section that is 30 electrical degrees long, followed by a 50 ohm section that is 30 degrees long. Pretty simple! And here is a twelfth wave transformer, with the sections set at exactly 30 degrees (1/12 of 360 degrees). Here they are compared. 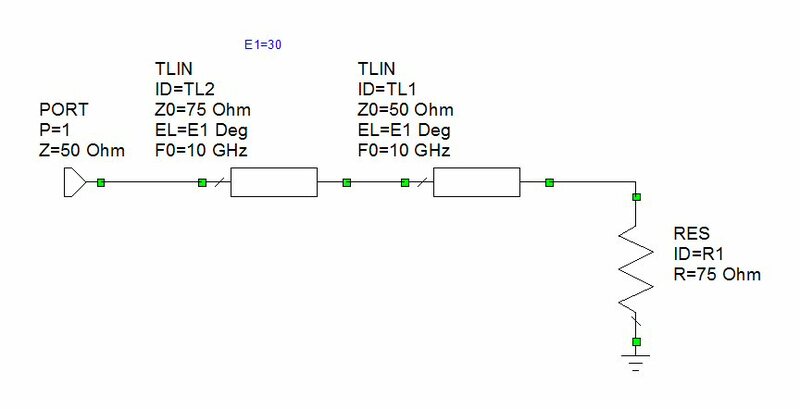 Note the the twelfth-wave transformer has shifted down slightly from the intended center frequency of 10 GHz. you can check out one of the on-line calculators for the exact solution (it is more like 29.3 degree sections). In practice you will probably use an optimizer to complete a design, then EM analysis to verify it. 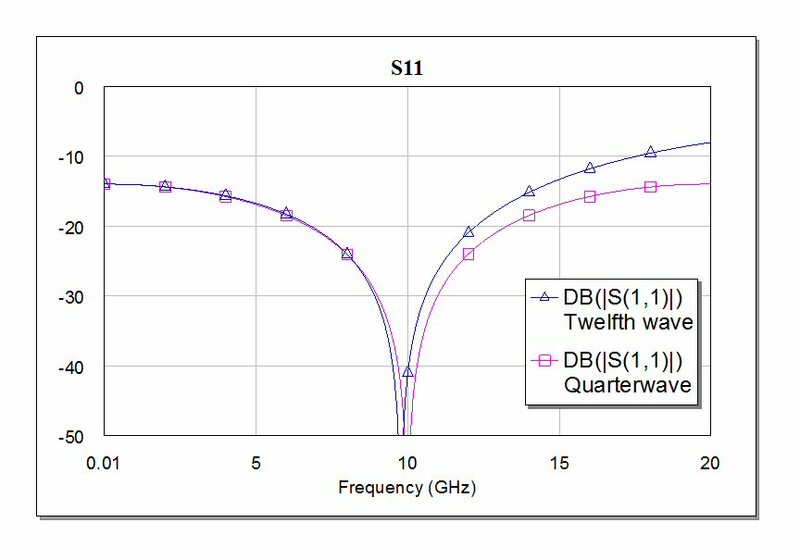 The twelfth wave transformer has slightly less bandwidth that the quarterwave, especially above F0. Of course, today's engineers don't need to use this transformer just to match 75 ohm cable to 50 ohms. Try it as the input matching transformer on a Wilkinson.... honey, you just shrunk the power splitter!